The national priority program “Spin Caloric Transport” (SpinCaT) funded by the German Research Foundation (DFG) was established to investigate ways to generate magnetic currents using differences in temperature and analyze their prospective future use to save energy in nanoelectronics. The Faculty of Physics of the Bielefeld University worked on seven projects in the program, which was launched in 2011 and has been successfully completed now. Dr Timo Kuschel and Professor Dr Günter Reiss and their research group realized further advancements in three projects. Each electron has its own angular momentum, and it turns on its own axis. In physics, this property is known by the technical term “spin.” The electron spins make electrons function as magnets. Yet, the most unique fact is that even while maintaining their position, by not moving, electrons have the ability to pass on their spin to adjacent electrons. This process, which is similar to a chain reaction, where a spin is magnetically passed on as information is known as the spin current. It can be produced using differences in temperature at two ends of an electronic component. In contrast to the normal electricity, the benefit of spin current is that it does not generate any additional heat, thus saving more energy. A major portion of the heat produced by electronic machines, such as computers, goes unused. In fact, a considerable amount of energy is usually required to cool the machines. A research team led by the Bielefeld physicists Dr Timo Kuschel and Professor Dr Günter Reiss used the DFG priority program SpinCaT to investigate ways to generate, manipulate, and detect spin currents. This will enable us to use wasted heat for new types of data storage along with other computer components based on spin current and thereby help to save energy. 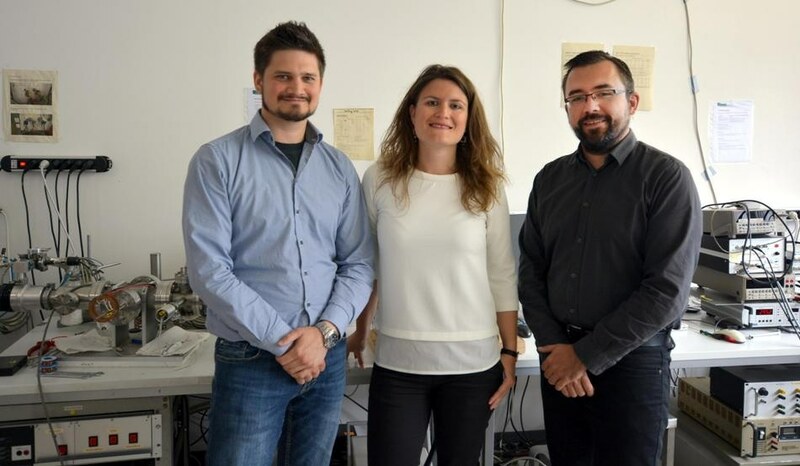 In collaboration with national and international universities, Dr Timo Kuschel, Dr Oliver Reimer, and the PhD student Panagiota Bougiatioti recently realized three advancements in fundamental research on spin caloritronics. Kuschel stated that confirming whether a spin current is generated in a particular material is not simple. “In some materials, it cannot be shown unequivocally, because other effects such as classical thermoelectric effects are automatically detected as well.” At present, Panagiota Bougiatioti, the Bielefeld PhD student, has successfully devised a technique for such materials, filtering out and isolating parasitic effects from the effect that generates the spin current. This allows researchers to determine unambiguously if a spin current is generated in a particular material. The project team also included scientists from Osnabrück University and the European Synchrotron Radiation Facility (ESRF) in Grenoble. The outcomes of the study have been reported in the Physical Review Letters journal. Spin current shifts along the path of a difference in temperature: for instance, a magnetic signal is transmitted from hot to cold. Dr Oliver Reimer, who obtained his doctorate from Bielefeld University’s Faculty of Physics, was successful in developing an innovative system with the ability to produce differences in temperature on a small scale of length and in particular spatial directions. This enabled spin currents to be induced, which vary spatially in a material — earlier, this was feasible in only one direction — and to investigate innovative types of effect that are based on the direction taken by a spin current. The Bielefeld project team performed this study in collaboration with the University of Regensburg. Reimer has presented the outcomes of the project as the first author in the Nature journal Scientific Reports. In another project, Dr Timo Kuschel worked with Dr Johannes Kimling from the University of Illinois in the United States and used very short timescales to evaluate the time taken for a spin current to occur. With the assistance of sophisticated laser technology, the researchers constantly repeated their experiment while changing the time between the generation and the occurrence of a spin current: what is the time span of the spin current after 1, 10, or 25 picoseconds? The paper by the international project team has been published in the Physical Review Letters journal. In 2008, researchers at Tohoku University in Japan established the foundation for studies in spin caloritronics. In the initial funding period of the priority program, the Bielefeld research group organized by the physicists Professor Dr Günter Reiss, Dr Timo Kuschel, Privatdozent (senior lecturer) Dr Andy Thomas, and Dr Jan-Michael Schmalhorst performed three projects on material and measurement problems in the thermal generation of spin currents. In 2014, the Faculty of Physics of Bielefeld University extended its contribution in the DFG program and was granted 800,000 euros for four projects. For the studies in the SpinCaT projects, researchers at Bielefeld collaborated with a number of work groups, including ones from Munich, Braunschweig, Greifswald, Alabama (United States), and Sendai (Japan).